The Alumni Parade of Classes, which has been a part of Class Day for seven years, is one of Columbia’s younger, lower-key traditions. It lacks the historical gravitas of the Varsity Show or the “students being students” nature of Orgo Night or Primal Scream (if unfamiliar, look them up at wikicu.com). It’s also one of my favorite days of the year. For those who have yet to participate (and it’s your loss), each year alumni are invited to return to campus and join in the Class Day processional by carrying their class banner. The Alumni Office provides a nice breakfast at which attendees can catch up with classmates or mingle with other alumni. This year’s breakfast was held in John Jay Dining Hall, a room that certainly brought back memories for those in attendance. 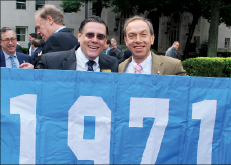 Alex Sachare ’71 (left) and Eddie Eitches ’71 prepare to march with their class banner in this year’s Alumni Parade of Classes. Ethan Rouen ’04JAlumni are given Class Day pins to mark their participation; this year’s pin depicted Butler Library, which is now in its 75th year. Then alumni head outside, where they line up with their banners and await their cue to take their place in the processional (after the seniors and before the faculty), and march over the hexagonal pavers from Butler to the Sundial. The walk takes only a couple of minutes, then participants may leave or stay to watch the rest of the Class Day program from a reserved seating area. What makes this event so special is the reaction alumni receive as they pass the graduating students. Once the first banner-carrier — this year it was Arnold Saltzman ’36 — comes into view, the students stand and cheer and keep it up until each class has reached the front of the seating area. Take it from one who has done it several times: It’s remarkably uplifting to carry your class banner, hear the cheers and feel the connection with the graduating seniors on this, their special day. Do yourself a favor: Keep an eye out next spring for the Alumni Office’s invitation to participate in the Alumni Parade of Classes, come back to campus and show your support for the next crop of Columbia alumni. Alas, one other Columbia tradition seems to have quietly gone by the wayside: sledding down the snow-covered Low Steps on trays purloined from John Jay. That’s because the dining hall recently completed its first year of trayless dining, and it looks like there’s no going back. The folks who keep track of such things found that by removing trays, diners make more careful decisions about their food choices, and there also are fewer service items to be cleaned. In the last year, Dining Services estimates it has saved approximately 3,000 gallons of water once used daily to wash the trays, and at least 50 pounds of food leftovers per mealtime. Sanitary, unused food is donated to City Harvest, a nonprofit whose mission is to rescue and deliver food to the hungry in New York City. If tray sledding had to go, at least it went for a good reason. One of the best parts of my job is meeting some of the remarkable people who are Columbia College alumni, especially those older than I who have led full and fulfilling lives. Some have maintained their relationship with the College across a half-century or more and continue to contribute their time, money or expertise to support the College. One such man was Arthur S. Weinstock ’41, who died in April (see Obituaries). I looked forward to seeing Arthur at College events such as Homecoming and awards dinners because he always had a smile on his face and kind words on his lips. He was active in his class’ affairs and was a staunch supporter of this magazine, often calling with thoughts and suggestions and even filling in with Class of ’41 Class Notes columns in a pinch. Ray Robinson ’41, another prince, called Arthur “the sweetest man I’ve ever met,” and I heartily second that emotion. He already is missed. Speaking of Class Notes, I call your attention to the Class of ’87 column and a submission from Annie Fils-Aime Joseph ’87 in which she describes, as correspondent Sarah Kass ’87 put it, “her experience as a doctor, a Haitian and a human” in trying to help some of those impacted by the earthquake in her homeland. Please take five minutes to read her story. Finally, to end on a happier note, filmmaker Marty Huberman ’91 is developing a documentary to be called The Streak Starts Now, about the players on the Lions football team that beat Princeton 16–13 on October 8, 1988, to end the record 44-game losing streak (or, to be entirely accurate, non-winning streak, since there were two ties) and the success so many of the players went on to achieve. He is looking for film, pictures — and stories. To learn more about the project, watch a trailer or contact Marty, go to www.TheStreakStartsNow.com.